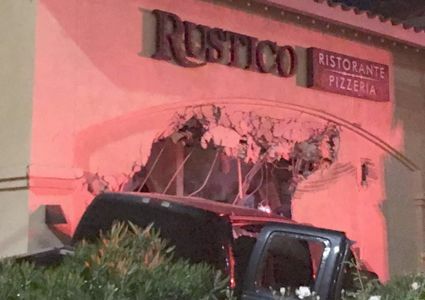 The owner of Rustico Ristorante and Pizzeria in Murrieta said the driver of this truck slammed into his building in the early morning hours of Friday. Rustico is temporarily closed. MURRIETA – Francesco Cusimano thought for sure his business, Rustico Ristorante and Pizzeria, was burglarized when a phone call from his alarm company woke him up at 3:45 a.m. Friday, July 27. Instead, when he arrived at the location of his restaurant, at the corner of Hunter and Winchester roads in Murrieta, he found a late model truck had crashed into the side of his business and demolished the south-facing side of the building. According to Cusimano, the driver was driving southbound on Winchester Road around 3:40 a.m. when he apparently fell asleep, veered off onto the grass hill off of the road and slammed into the restaurant. He said when he got to the restaurant, all the authorities were on the scene. Francesco Cusimano said this truck smashed into his building early Friday morning. Cusimano posted a notice on the Rustico Facebook page, notifying his customers what had happened and that the restaurant would be closed until further notice. Cusimano said once his insurance company finishes their assessment and the health department can inspect the damage and impact on the business, he can reopen. Calls to the California Highway Patrol were not returned before press time.